San Quentin’s strength work deploys MTI’s “Efficient” strength progression methodology. San Quentin is the 2nd Plan in our notorious prison packet of plans for full-time Correctional Officers. 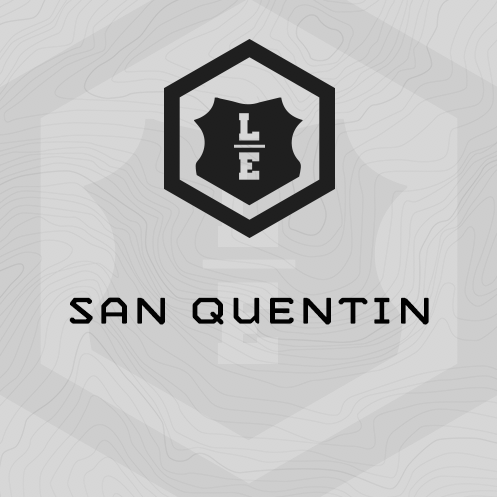 San Quentin is a 7-week, 5 Day/week, balanced training cycle. This training plan concurrently trains total body strength, upper body hypertrophy, work capacity, grip strength, tactical agility, and Chassis Integrity (functional core strength). San Quentin’s strength work deploys MTI’s “Efficient” strength progression methodology. “Efficient Strength” is an old-school circuit of 4 strength exercises – one each of a Total, Lower, Upper Body Press and Upper Body Pull. The exercises are trained together in a “grind” format. San Quentin trains strength two days per week, Tuesdays and Thursdays. A large, muscular, upper body can be a deterrent for Correctional Officers. San Quentin trains upper body hypertrophy (mass) two days per week. San Quentin deploys gym-based, multi-modal work capacity events with 17-21 minute duration. You’ll train work capacity twice per week. San Quentin’s Chassis Integrity efforts are all low back (extension) focused. Each Chassis Integrity circuit deploys 3-4 low back or extension exercises. You’ll train your low back strength and strength endurance 2 times per week. These circuits are 15 minutes long. San Quentin deploys MTI’s Gi Grip Strength Assessment and progression to train your grip. San Quentin deploys three of MTI’s tactical agility drills to train this fitness attribute. You’ll train these drills once per week. San Quentin requires a fully outfitted functional fitness gym with barbells, bumper plates, racks, dumbbells and/or kettlebells, plyo boxes, pull up bars, sandbags, etc. Part (3) - Use your Gi Top hung through a ring or over a racked barbell so that the sleeves are hanging. Set a timer clock to beep every 10 seconds. Intervals - use your assessment time and the prescribed percentage to determine how long to hang for each round.